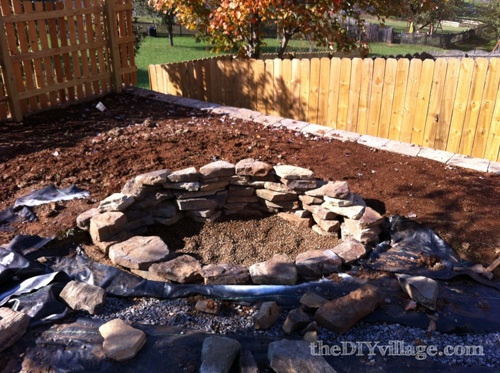 Today we’re featuring a guest contribution by Matt from the DIY Village on building a custom fire pit. If you don’t know Matt and Jacque, hop on over to their site. It’s chock full of awesome DIY articles! When it comes to transforming a back yard, an outdoor fire pit rates high on everyone’s DIY to do list. When my wife, Jacque and I purchased our new home a few years ago, we were moving from a townhouse. One thing that always bugged me about living there was that we were restricted on what we could modify outside of the footprint of the house, as the yard itself was considered common property. So when we made the decision to move, one of the first things I thought of was how great it would feel to be able to decide for ourselves what our new backyard should look like. The first thing on my list was a custom fire pit. We’re lucky to have an incredibly talented friend, Jesse Hoffman, who is a professional landscape designer. We coaxed him into stopping by and sharing his thoughts on what we had in mind. 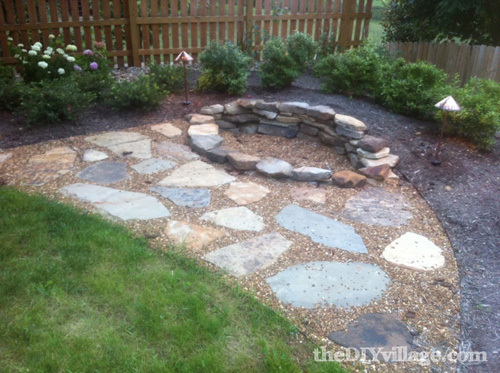 I had envisioned a circular stacked stone fire pit, but Jesse introduced an idea that involved a more unique shaped fire pit and landscaping around it. I think Jacque saw an opportunity to coach him into adding the landscaping as part of the project just to add more to the “Never Ending Honey-Do-List” (Of course she’d never admit to that). Jesse’s idea was to have a fire pit in the shape of an eye, have an area for seating in front of it and a mounded landscape bed surrounding the backside. 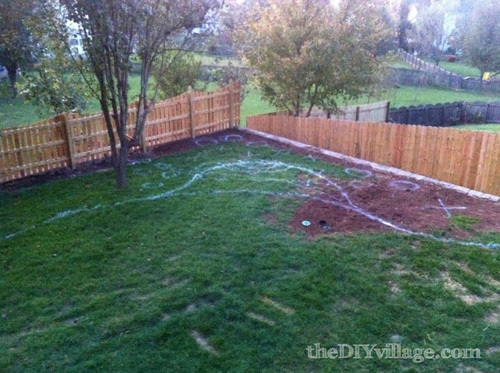 Here’s what we started off with…Basically just a blank canvas! 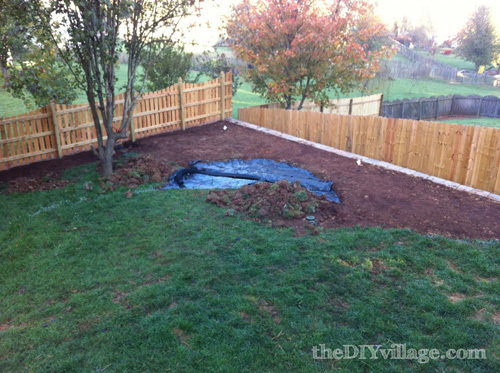 We had to bring in more fill dirt to level out the areas next to the retaining wall. Next we laid out the design onto the ground with spray paint to give us a feel for where everything would be, plus it made it easier to know where and what to dig! Then we brought more dirt in to build up the landscape beds. Altogether we hauled in an additional twelve cubic yards of fill dirt. The next step in the installation was to dig out the actual shape of the fire pit. As you can see in the picture below, I created a drain channel within the patio area of the fire pit. I added this because our yard has a natural slope towards this corner and wanted any run off to be routed elsewhere. 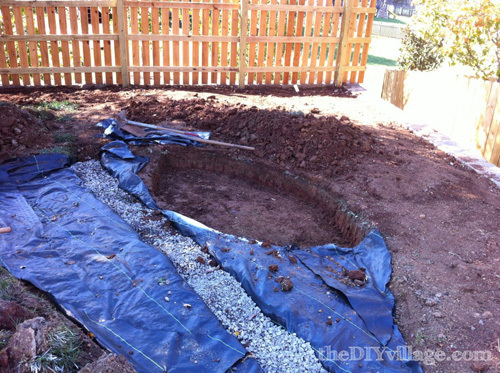 For the actual fire pit shape, I chose to dig down about eight inches which allowed me enough room to lay a base layer of gravel to allow any water to drain below the surface of the fire pit itself. With the gravel in place we then began to stack the stones to around the perimeter of the fire pit. Truth be told, there wasn’t much skill involved in the stacking process, I just basically used stones that stacked nicely side by side and on top of each other. I could have used mortar to secure the stones in place, but with the height being so minimal and the higher stacked backside being built up against a mounded landscape bed, I felt that there was already plenty of stability. Now that our custom fire pit was practically complete, we brought in the shrubs to finish off the custom look. 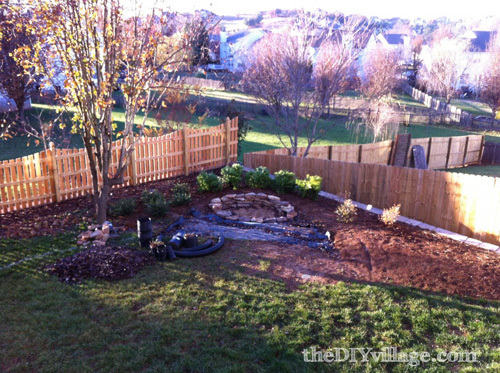 We were careful to choose a variety of plants that wouldn’t leave the yard feeling bare in the fall or the winter. We placed flagstone pavers to make up the area where we plan to having seating and we placed metal bed edging to help border and define that space. Lastly we added pea gravel as filler in between the flagstones and we added a few low voltage landscape lights to accent the area at night. Every time we build a fire out back, I’m reminded how nice it is to have the freedom to choose how I want my yard to look. Having a custom fire pit really added a nice decorative touch to a previously sparse yard! If you’re looking for more outdoor project inspirations, we’d love for you to check out our DIY Paver Path! That’s very nice. I built a fire pit on my back patio with 30-40 stones. We use it every night in the summer and cook on it as well. I love this! Our backyard has a firepit that was here when we bought the house. Not in the ground, however. I really like the stone patio area. If we end up staying here (our house is on the market) just may have to incorporate that into our seating area! This is great. I’ve had ideas for a firepit for the last year or so (but just recently moved so I have just begun work on it). 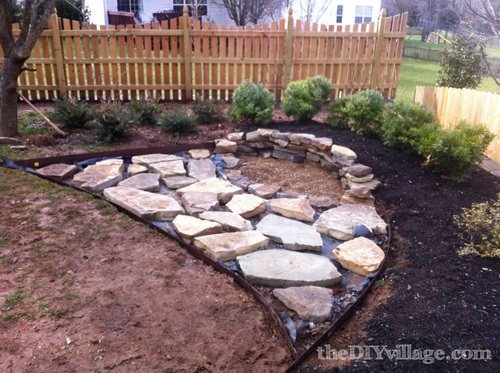 This gives me some really good ideas for the landscaping part of it–in particular, the flagstone. I still can’t decide if I want to mortar the pit itself though. The plans for my pit are a little higher and will probably get more use than this one. looks good, how do the neighbors feel about that wall being almost as tall as their fence? I want to put a fire pit in my yard as well, I have an area of hill which is really too steep for anything else, I will probably put it there and build it up with stone from the woods (there is an old stone wall I can steal from). 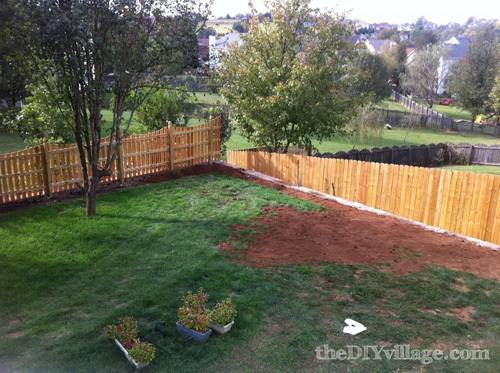 Joe, when Jacque and I moved into the house, the former owner had leveled the yard resulting in the retaining wall. Atop the wall, there used to be a fence. 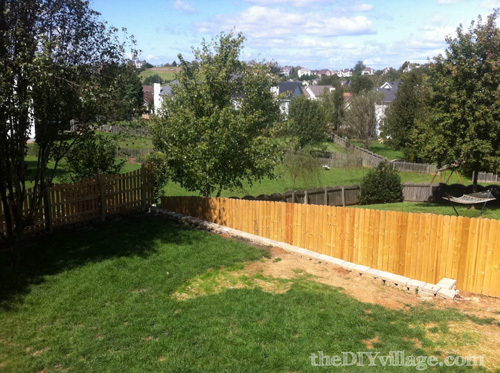 We actually talked with our neighbors first and let them know that we planned on removing the fence and nicely landscaping the area. They were actually really excited that their view wasn’t going to include a super tall fence anymore. Anytime we change something that may affect someone around us, we try to talk with them first to see if they have any objections! I like it. There’s always a tension between whether or not seating should be hardscaped in around the pit or whether it should be more informal (i.e. bring your own lawn chair). I always think that building the seating in permanently gives the whole thing a touch of class and establishes the pit as a focal area at all times – even when there’s no fire. However, flexible seating has some benefits too, like being flexible. What a great space! I’ll definitely be checking out their blog. Right now our house doesn’t have a lawn in favor of a cobblestone patio with a surrounding garden bed, but I’d love something like this in our next house as well. We have a fireplace/ chimney in our backyard. Some of the previously mortared rocks have come loose. Anyone know of a product that can secure these and handle the heat of a campfire? The firepit described and pictured above is very nice! LOTS of dirt moved around, but the outcome looks worth it. I like how you outlined the area with spray paint makes sense and helps scale the plans too. Very cool. I’d like to have one, but summer is too hot for sitting around a fire and we have so many “no burn” days (vs air polution) in the winter that it wouldn’t be worth having. 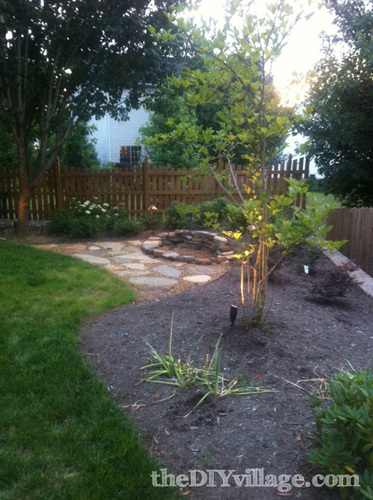 This is fantastic – I’m working on a little landscaping in the yard now and have been thinking about fire pit. I might need to incorporate this. That’s awesome. It’s already a future project of mine. I just finsished our backyard firepit and we used it last night and everyone totally enjoyed it. I do love checking out how others build theirs. I also plan to visit this guys site as well. It looks fantastic! It really looks as if it was always there. Beautiful job. We recently took our kids camping for the first time a few weeks ago and my little man is naturally now in love with fire. I see one of these in our future when we get a single family one day. I have an idea to be able to incorporate a grill grate so it can be used to cook as well. What an awesome change to your backyard Matt and Jacque. I had to laugh at your “honey do list” comment. It’s certainly never ending. My hubby has gotten so he shudders when he hears me say “I’ve been thinking”. Great tips! I’ve been meaning to build a fire pit for quite some time now, my children are always asking for s’mores. Need to get it done! This is really beautiful. And it actually looks like something I could do! Thanks for the idea. What a great fire pit – it’s completely changed the area and made it look so cosy! I really want to put in a fire pit near my vinyl pool – on the other side of the fence of course! Summer nights here we come!